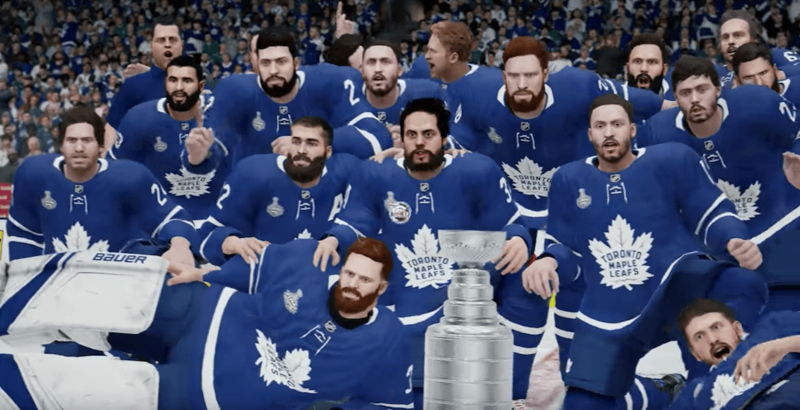 EA Sports is predicting that all of your dreams are about to come true, Leafs fans. For everyone else, a nightmare? The video game company based out of Burnaby, BC has released its annual NHL 19 season simulator ahead of the start of the NHL season on Wednesday. The simulator runs through the regular season and playoffs. Not only will the Toronto Maple Leafs finish atop the Eastern Conference, they’re going to win the Stanley Cup for the first time since 1967, according to EA. They’re also going to do it on home ice. Toronto is predicted to beat Erik Karlsson and the San Jose Sharks in the Cup Final, with new Leafs centre John Tavares winning the Conn Smythe Trophy as playoff MVP. News isn’t as good for other Canadian NHL teams. The Ottawa Senators are predicted to finish last overall in the NHL standings – and by a wide margin. Last in the West, and third-last in the overall standings, are the Vancouver Canucks. The Montreal Canadiens aren’t much better, predicted to finish one spot higher than Vancouver. EA is predicting that the Calgary Flames and Edmonton Oilers will miss the playoffs for a second-straight year. For Edmonton, this comes despite a Hart Trophy season for NHL scoring leader Connor McDavid. The only other Canadian team the simulator sees making the playoffs are the Winnipeg Jets, but they’re getting ousted in the second round.